We showed you Scott McClure's Crashy the Yaris Snow Plow in December of 2009. Well, Crashy recently got an update making it the world's only Yaris dump truck. Wait. 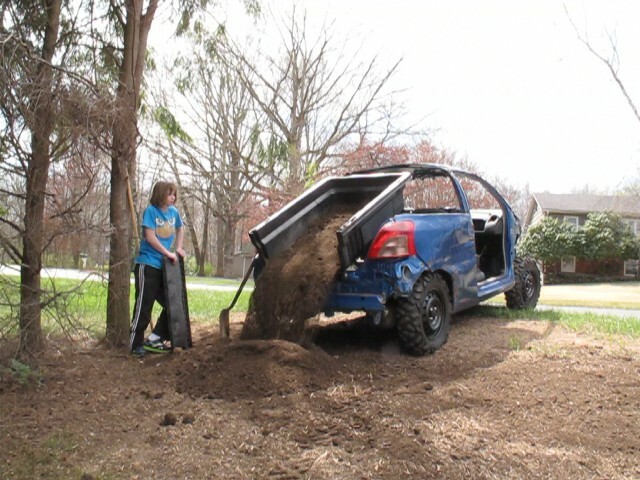 Make that subcompact dump car. According to Scott, Crashy uses a linear actuator rated for 1,320 lbs of lift and a six-terminal snow plow solenoid to control the lifting and lowering of the bed with a three-position rocker switch, mounted to the dash. There's a support structure for the linear actuator and a frame to make the bottom of the molded bed stiff enough to be lifted. The bed is from a 15 cubic foot Rubbermaid garden tractor trailer. Check out Crashy in action below. I wonder what use Scott will think of next for Crashy? The one thing I'd have done differently for the Crashy project is I'd have left the glass and doors intact and added a divider behind the front seats. Why convert a fully-enclosed, heated plow rig into an open one?